After a bustling and successful turnout of more than two thousand people for their launch event in August, Melbourne Ceramics Market is back bigger and better, showcasing over fifty emerging and established ceramic makers under one roof and aiming to create a vibrant marketplace that highlights and reflects the work of Melbourne’s finest ceramic talent. First impressions count - whether on your website, bricks and mortar store, or a market stall. Presenting a cohesive look is part of your overall branding, so try to consider every detail, from signage and marketing collateral to packaging and receipts. For a market stall, you will need displays and props to present your items, and these can be sourced from surprising places. As a jewellery maker myself, when I first started doing markets, I couldn’t find anything that matched the aesthetic of my shop’s brand, so I decided to build everything from scratch. It was surprisingly not that difficult, fun to do and if you have a partner or a friend who is DIY-inclined, why not partner up to complete this project together? First thing is to do some research, gather some inspiration and draw up your plans. Rather than sit in front of your computer for research, do it the old-fashioned way and visit markets in person. Check out The Finders Keepers, The Big Design Market,Handmade Canberra or even local craft markets. You can also browse your favourite retail shops and boutiques for visual merchandising inspiration too. What overall colour scheme would you like? How do these colours fit with the overall branding of your business? What do these colours represent? It could be helpful to look into colour psychology and research what different colours represent. Would these colours appeal to your target customer? It’s important to consider the height and the size. Most market stall sizes are at least 2m x 2m or bigger, so perhaps you’d like to consider maximising this area. Will you have one long rectangular table? 2 smaller square tables? A mixture of these and some shorter or taller stands? What sort of materials will you make your table from? Wood? Plastic? Metal? A mixture? How will you be able to assemble and disassemble your display table(s)? Will this require the use of power drills or slots? What type of finish will you have on your table? Leave things as per the natural material? A wooden stain? 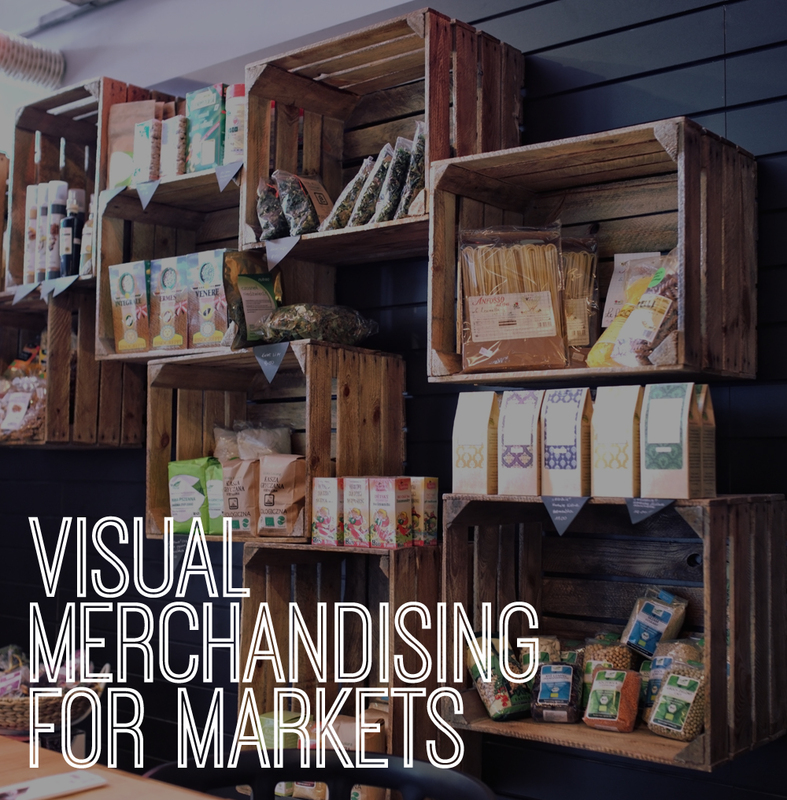 Displaying your goods on levels or tiers enables people’s eyes to scan around your entire space, and not just skim across and to the next stall. Building upwards, allows you to place your products at different heights and lets people to see different things from different distances without needing to hunch or stand on tippy toes! Shelves, A-frames and T-racks also maximises your display area and adds visual interest. Building a back wall, sidewalls or even a stall frame gives you more creative opportunities to display your goods. Don’t forget about the ceiling and floor too! Will this be easily transportable in a car or will you need a truck or multiple cars? Will you need a crew to help you set up? Often having an unusual or aspirational piece can attract the eye of people in the market and draw them into your stall for a closer look. Although it may be a higher end piece that may not necessarily sell, nevertheless if attracts people to your stall, it’s doing it’s job! Whether they’re tags, stickers or blocks, sometimes customers may not want to ask how much an item is and that could potentially be a lost sale! Make sure the aesthetic matches the overall theme of your brand and if you have messy handwriting, consider getting them printed and laminated. Thinking about the security of your products is important, especially when the market is busy and there’s lots of customers browsing and wanting to make a purchase. How can you package your goods and display them in a way that would deter theft? Customers usually like to hold items or try things on before buying, so keep this in mind when you’re designing your stall layout. Do you want customers to be able to easily access all your goods? Consider placing your lower price point items closer to the front and your more expensive items in elevated and more secure locations. It’s important to have a banner, signboard or something similar to display your shop’s logo so that it’s easy for people to remember your shop’s name. Having your shop’s name and logo on display also helps strengthen your brand and helps people who may have come especially to visit your stall, to easily identify your stall in the entire market. Banners or signboards don’t necessarily need to be professionally printed, these can look a bit corporate and not fit with your branding. As you’re a crafty maker – bust out your creativity! With a bit of fabric, paint, sewing skills or even chalk you could create an artistic alternative. Make sure you have plenty of business cards with your shop’s name, your name, email address, website and social media! Sometimes people who don’t buy on the actual day buy later through your website – so don’t miss these opportunities! To calm your pre-market nerves, I like practising laying out my entire stall display, so I can test where things look best. Once I’m satisfied with the layout, I take pictures, so on the actual market day, I can easily replicate my chosen layout.